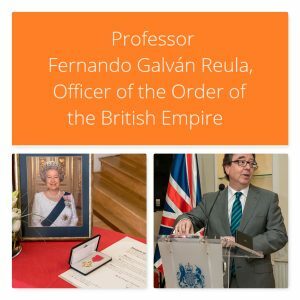 As already known, Professor Fernando Galván, the former ESSE president, has been awarded the O.B.E order of the British Empire by the Her Majesty Queen Elizabeth II. On 25th April 2018 the British ambassador in Madrid, Mr Simon Manley, held a reception at his residence (some 60 guests attended) in order to formally impose Professor Galván the medal of Officer of the Order of the British Empire conferred by HM Queen Elizabeth II in 2017. Many academics from half a dozen universities in Spain (University of Alcalá, Complutense University of Madrid, Autonomous University of Madrid, Technical University of Madrid, National Open University, and University of Salamanca), as well as some educational authorities, diplomats and members of the British Council in Spain were present. Click on the Picture Gallery, then on Start Slide Show to see the pictures taken at the ceremony. Professor Fernando Galvan, our former ESSE president, has been awarded the O.B.E order of the British Empire by the Queen to distinguish him for his contribution to developing educational relationships between Spain and Britain. This is a very rare occasion to give such a tribute to someone outside Britain. This conference is a tribute to a neglected poet and Franciscan martyr. It is a privilege to host it in Umbria. 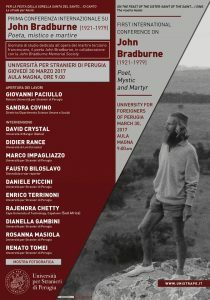 John Bradburne wrote many poems inspired by Umbria and Saint Francis, and one of the reasons for his strong African ‘sense of place’ was that the hills of Zimbabwe reminded him of the Apennine and the Assisi The influence of Franciscan poetics and a theology of militant love, as well as a mystical wedding to Our Lady is recurrent in his themes. He is now recognized as the most prolific poet in the history of Anglophone literature having written twice as much verse as Shakespeare. French historian Didier Rance has translated his poems into French. An online corpus of his John Bradburne’s poems has been compiled and edited by the British linguistics author and reference-book editor David Crystal. John Bradburne, FTO (Franciscan Third Order) was born into an English ecclesiastical family. After heroic war-time service (Military Cross) with Gurkhan Indian Army in Malay and Burma, and miraculous survival in the jungle, he entered the Catholic Church. He studied theology in Louvain where he was a novitiate (1950-52). In the 1950s, he embarked on spiritual journeys through France and Greece. His pilgrimage to the Holy Land took him through Italy twice: to Umbria and Campania, where he lived for one year. He spent the last ten years of his life in a leprosy settlement in Rhodesia . During the Rhodesian civil war, he refused to leave his lepers; after being abducted and tortured, he was tried by the guerrillas and released, only to be shot. At the moment of his passing away and at his Requiem Mass in the Cathedral of Salisbury, inexplicable events occurred. 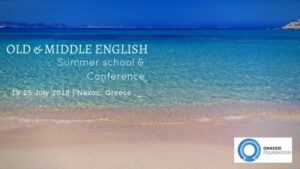 Host Institution: Aristotle University of Thessaloniki, School of English. 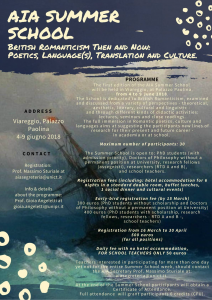 The summer school will offer Old and Middle English intensive language and linguistics classes for a period of nine days. The aim is to attract students and scholars to study Old and Middle English in a relaxed yet very focused and stimulating atmosphere that promotes in depth analysis and discussion. Certificate of attendance will be awarded to all participants plus certification of the 6 ECTS gained. Please notice that the registration fees cover the accommodation in the municipality hostel for the whole period of classes. 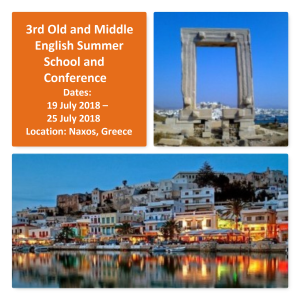 Students will also be offered a discount of 50% for the ferry tickets, and a light lunch will be offered to participants. 2016 brings the publication of the 20th volume of the European Journal of English Studies (EJES). To mark this occasion, the Editors have curated a special collection of articles which not only showcases the breadth of scholarship that has been a feature of the journal over the last two decades, but also hopes to inspire contributions for future issues. The anniversary collection features an article from each volume of EJES, free to read, with a commentary from the Editors. It also includes an insightful introduction from Professor Kayman which is designed not only to look back on previous content, but also to inspire contributions for future themed issues. You can see the Virtual Special Issue on the Taylor & Francis website here: http://explore.tandfonline.com/page/ah/neje-20th-anniversary-vsi.